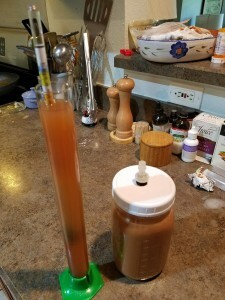 I’m starting to think that pumping up the ABV with honey is what causes oddball flavors in my concoctions. I’m going back to basics this time, no added sugar or honey. Wheatsville only had 2 gallons of apple juice so I also bought a gallon of Knudson’s cranberry pomegranate juice. Like most juice blends this is mostly apple juice so this should be a nice, simple hard cider. Total cost of ingredients for 3 gallons is $40. For yeast I’m using reclaimed champagne and red wine yeasts. The red wine yeast is from my recent experimental batches so I’m sure it’s potent and active. The champagne was reclaimed back in March I think so I’m not sure of its potency. Yeast: Red Star Premier Rouge Wine Yeast and Red Star Premier Blanc (Pasteur) Chapagne Dry Wine, < 2$, reclaimed from prior batches. I kickstarted the yeast yesterday in a mixture of the same juices overnight. It’s bubbling away quite happily. 2017-08-13: Racked it to a carboy. The must is pretty tasty, seems promising. I’m hoping it turns out like the bottle of mixed cranberrry and regular cyser from Cyser Experiments. Bottled it today. Heh, I guess my enthusiasm is waning because I didn’t wanna rack this batch at all before bottling! Final Gravity = 0.998. Ah geez, I didn’t record the Original Gravity so I have no idea how much alcohol is in it. pH is also unknown b/c it looks like the batteries are dead on my pH meter. Flavor wise it’s a bit sour and flat. Could be the effects of leaving it sitting on the chub for so long. Now that it’s in bottles I’ll work hard to remember my lessons learned… leave it alone! The flavors will continue to develop and I’m betting it will be pretty tasty by December.